the world’s leading event for learning technology for education professionals… dedicated to showcasing the best in UK and international learning technology products, resources, and best practice… in times where modern learning environments are becoming more mobile and ‘learning anywhere’ is more of a possibility. I liked the examples that I saw of increasing use of Google Apps in education, particularly on Chrome Books. These examples were described by teachers who had been involved in trials, at all levels of education. The teachers had plenty of heart-warming stories of human wonderment, of pupils helping each other, and of technology taking a clear second place to learning. I was also impressed to hear some updates about the use of MOOCs – “Massive open online courses”. For example, I was encouraged about what I heard at BETT about the progress of the UK-based FutureLearn initiative. FutureLearn is a massive open online course (MOOC) platform founded in December 2012 as a company majority owned by the UK’s Open University. It is the first UK-led massive open online course platform, and as of October 2013 had 26 University partners and – unlike similar platforms – includes three non-university partners: the British Museum, the British Council and the British Library. Among other things, my interest in FutureLearn was to find out if similar technology might be used, at some stage, to help raise better awareness of general futurist topics, such as the Technological Singularity, Radical Life Extension, and Existential Risks – the kind of topics that feature in the Hangout On Air series that I run. I remain keen to develop what I’ve called “London Futurists Academy”. Could a MOOC help here? I resolved that it was time for me to gain first-hand experience of one of these systems, rather than just relying on second-hand experience from other people. The course lasts eight weeks, and is described as requiring about three hours of time every week. Participants take part entirely from their own laptop. There is no fee to join. The course material is delivered via a combination of videos (with attractive graphics), online documents, and quizzes and tests. Participants are also encouraged to share some of their experiences, ideas, and suggestions via the FutureLearn online social network. For me, the timing seemed almost ideal. The London Futurists meetup last Saturday had addressed the topic of climate change. There’s an audio recording of the event here (it lasts just over two hours). The speaker, Duncan Clark, was excellent. But discussion at the event (and subsequently continued online) confirmed that there remain lots of hard questions needing further analysis. I plan to invite other speakers on climate change topics to forthcoming London Futurists events, but in the meantime, this FutureLearn course seems like an excellent opportunity for many people to collectively deepen their knowledge of the overall subject. It’s fascinating to read online the comments from other participants in the course. It looks like over 1,700 people have completed the first week’s material. Some of the participants are aged in their 70s or 80s, and it’s their first experience with computer learning. There hasn’t been much controversy in the first week’s topics. One part straightforwardly explained the reasons why the observed changes in global temperature over the last century cannot be attributed to changes in solar radiation, even though changes in solar radiation could be responsible for the “Little Ice Age” between 1550-1850. That part, like all the other material from the first week, seemed completely fair and objective to me. I look forward to the subsequent sections. I said that the timing of the course was almost ideal. 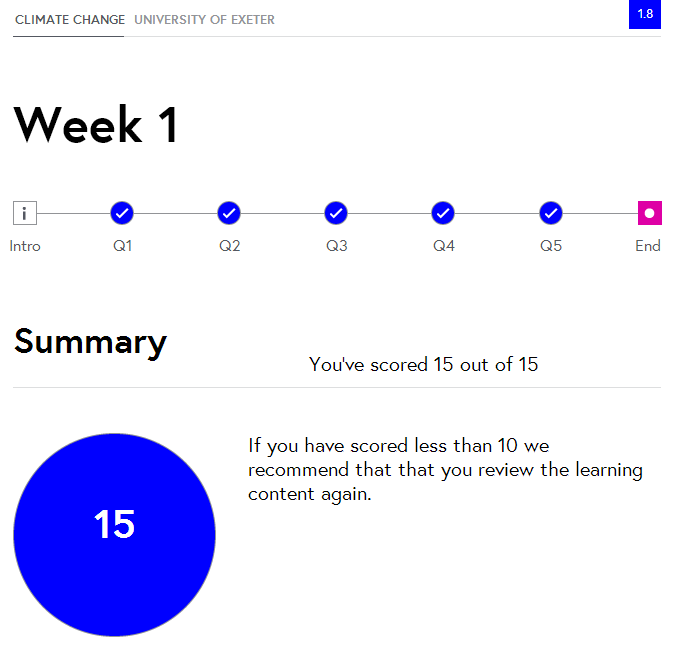 However, it started on the 13th of January, and FutureLearn only allow people to join the course for up to 14 days after the official start date. That means if any readers of this blog wish to follow my example and enrol in this course too, you’ll have to do so by this Sunday, the 26th of January. I do hope that other people join the course, so we can compare notes, as we explore pathways to improved collaborative learning. PS for my overall thoughts on climate change, see some previous posts in this blog, such as “Six steps to climate catastrophe” and “Risk blindness and the forthcoming energy crash”. however, who is going to pay for the content creation in the long term, currently most MOOC’s are funded as pilots / experiments. Apparently there was a panel session at BETT today “Can MOOCs be monetised?”. I’m sorry to have missed it. From browsing the Twitter back-channel, I think one suggestion is that MOOCs serve as good marketing for people to enrol at the university for in-person courses, but I’m sure there’s more to it than that.